A snake sheds its skin when its insides grow bigger than its outside. Some snakes shed more than once a year as new skin is formed beneath the old layer. Shedding is necessary because it allows for growth and is crucial for survival. During its shedding cycle, a snake is vulnerable to injury and disease. Often it must rub its body against a hard rough rock to create a rip in the old skin to help begin the shedding process. The snake continues to work on the tear until it can shed the layer cleanly and completely. The eyes of a snake shed too, they become cloudy with a layer of old skin, a time when the snake is vulnerable to attack until they are clear again. Experts who work with snakes say that the sloughing of old skin, though natural and needed, is not an easy process for a snake, especially with the risk of wounds and disease if old fragments of skin become stuck. But despite the discomfort and danger, the process of shedding the old is necessary for growth and a healthy life. The snake has no choice but to let go of the old form or it will die. The symbolism of a snake’s shedding, the sloughing of the old as a necessity for interior growth, reminds us that the same type of process can occur for humans. We grow, we need to let go. Releasing what is no longer needed is not an easy task but it is an important part growth and development. The insights discovered and feelings of renewal are well worth it. Humans are capable of so much more than just surface sloughing of skin cells, hair shedding, and nail clippings. If we are to evolve we need to let go of what no longer works in our lives including old beliefs and patterns, attachments, closed-minded biases and opinions and so on. Most of us experience the ups and downs of life. We encounter struggles and cycles of development that create a type of friction urging us to respond. Some situations push us to transform, to cross a life threshold. These cycles help to shape who we are and who we can become. We look back on our lives and reflect on the many ways we have been challenged by events and emotions and how we are have changed over the years. We have grown and outgrown the old ways of life and living, we outgrow our former ways of perceiving to become who we are meant to be, for a time, in the current moment. When we grow on the inside we need room to expand. Despite the discomfort, the process of shedding the old self is encouraged as a necessity for new growth and a healthy life to unfold. By releasing what does not nourish us, including our thoughts and actions – those things that no longer support inner growth and well-being, we create an improved environment for a new refreshed self to emerge and thrive. Most people change as the years go by, one way or another we transform many times during a lifetime. No matter how hard the process, no matter how wounded we feel at the time of self-inquiry, eventually something shifts and the old way of being, the old skin, sloughs away in its entirety and we are freed. Letting go of outdated and distressful patterns of behavior allows for the inner growth to move outward into the world. In this way we are similar to a snake in that as we grow bigger on the inside we must release all that is unhealthy so we make room to thrive. Serpents are the name given to a snake-like creature as described in religious and mythological stories. In the Judeo-Christian tradition of the West, the snake in the Garden story is associated with manipulation and sin for Adam and Eve, whereas in many other cultures, snakes and serpents are aligned with healing, mystical and psychic powers, and regeneration. Serpent themes are visible in architecture, in myth, and initiation rites from certain cultures. Healing power and mysticism are ascribed to snakes due to their ability to shed skin. 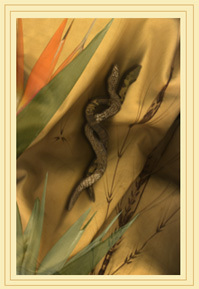 The snake represents youthful vitality, an archetypal power of transmutation and immortality. Images of snakes appear in alchemical symbols representing vitality, healing and transformation, and the death/rebirth cycle of renewal. This similar symbolism is also seen in-depth psychology. The alchemical image of the Ouroboros, the snake eating its own tail, is a symbol of wisdom. It is a symbol of the conjunctio, the union and wholeness of the divine marriage of the female and male principles. The Ouroboros is associated with Alchemy. It represents the cyclical nature of things, eternal return, and other things perceived as cycles that begin anew as soon as they end. In some representations the serpent is shown as half-light and half-dark, echoing symbols such as the Yin Yang, which illustrates the dual nature of all things, but more importantly, that these opposites are not in conflict. The Ouroboros can represent self-reflection, or something constantly re-creating itself, the eternal return, things perceived as cycles that begin anew as soon as one ends Something like the Phoenix who rises from the ashes. It can also represent the idea of primordial unity related to something existing in or persisting from the beginning with such force or qualities it cannot be extinguished. The ouroboros has been important in religious and mythological symbolism but has also been frequently used in alchemical illustrations, where it symbolizes the circular nature of the alchemist’s opus. The uraeus is the royal headdress of the Egyptian pharaohs with the cobra image worn at the brow. It signifies a connection with divine power and protection. Naga is Sanskrit word for a deity or a group of beings that take the form of ‘the Great Snake’ the King Cobra. These entities are found in Hinduism and Buddhism. Tibetan and Chinese traditions, including feng shui theory and the wisdom of the snake, serpent and dragon as symbols of protection, good fortune and health. The ritual rattlesnake dance of the Hopi Snake Clan people is done as an invocation to bring the rains. We also have stories of the Dragon (a relative of the snake/serpent) in Merlin Lore we have the dragon, medieval stories and around the world. The feathered winged serpent-god of Central America, a supernatural deity. It is said the feathered aspect represents its ability to fly as a sign of its divine nature and the serpent aspect represents its human aspect, the ability to move on the ground. Asclepius, the ancient Greek god of medicine, healing, and dreams, known for his staff, the single snake coiled around it. It was believed that a dream of a snake signaled healing and a union with god. Python was sacred to his cult. The caduceus is a symbol of modern Western medicine. Two snakes entwined around the winged wand of Hermes, the messenger of the gods, implying healing, harmony, and symmetry.